数据来源： Common Sense Advisory, Inc.
数据来源 Common Sense Advisory, Inc. Since 2005, Common Sense Advisory has published an annual list of the 20 largest language service providers (LSPs). Solid growth in the translation, localization, and internationalization space led us to expand our list this year to the Top 25. Based on the revenue data we collected and in conversations with LSPs of every shape and size, 2007 was a banner year. The average year-over-year growth rate of companies in our 2007 Top 20 list was 26.68 percent. We revised our 2007 estimate from US$10 billion to US$12.1 billion and adjusted our projections accordingly (see Table 1). Based on the trend-line over the last five years, we predict that the market will reach US$24 billion by 2012. That growth equates to a compound annual growth rate (CAGR) of 14.6 percent over the coming quinquennium. We can attribute some of the revenue growth �C four percent, to be exact �C to foreign exchange issues. However, the main driver for growth was increased sales in an economic environment favorable to international trade and relations. These simple rows and columns mask a landmark change in the market. 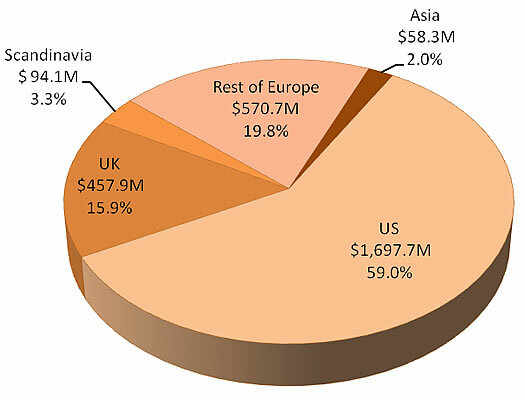 Europe now represents more translation revenue than the United States. The 15 euro-zone countries surpassed the U.S. in GDP for the first time. The European Union as a whole topped the United States in terms of broadband penetration. The translation industry went along for the ride. LSPs are reaping the benefits of a more global economy and are growing despite indications of a recession in the United States. As always, Common Sense Advisory’s list of the top-performing translation companies goes beyond translation to include companies or divisions of companies that make most of their revenue by providing language services, be it in written or verbal form, on paper, over the web, in person, via video, inside software applications, in Brno, Des Moines, or Shenzhen. Because there are so few publicly traded companies in the language arena, this list always involves a lot more legwork than producing a similar register for the automotive or telecommunications industries. So it goes. Public companies. All the public companies show up on our list, accounting for 36 percent of our final tally. For most of these firms, we have the luxury of reviewing annual reports and official filings. 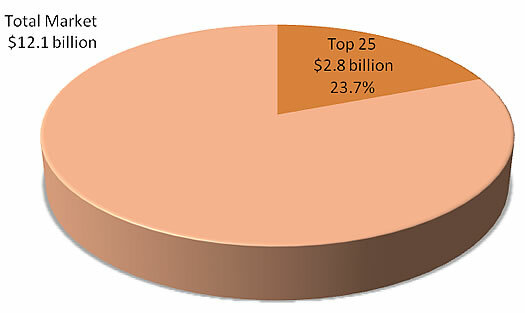 However, some of these are large corporations with specialized business units for which they do not break out numbers. For these companies whose main activity is not language services, but have business units or divisions that provide such services, we considered only that unit’s revenue. Getting these numbers can be a challenge. Our list for 2007 includes LSPs from 17 countries: the U.S. (6), U.K. (4), Czech Republic (2), Switzerland (2), and China, Finland, France, Ireland, Italy, Japan, Luxembourg, Netherlands, Norway, and Sweden (one each). LLCJ is a joint venture of companies from four countries (Belgium, Germany, Italy, and Spain). While American and British companies still dominate the rankings, Scandinavia tripled its contribution of LSPs to the list with companies from Finland, Norway, and Sweden �C and a Danish company, LanguageWire, also almost made it to the Top 25. Meanwhile, a second Asian LSP, hiSoft, joins Honyaku in the top echelon. With so many of the Top 25 reporting revenue in other currencies, our conversion into a baseline unit �C the U.S. dollar �C becomes even more important than in the past. For non-U.S. companies outside the United States, we divide their revenue in local currency by average exchange rate for the 365 days of their fiscal year. Thus, the average exchange rate for tenth-ranked RWS Group was US$1.9692 per pound sterling (GBP) for the fiscal year ended on 30 September 2007. Third-ranked SDL, reporting its results on a calendar year, benefits from the run-up of the pound against the dollar for the balance of 2007, with the dollar quoted at US$2.0018. The market is organized into several visible tiers, as we pointed out in the Global Watchtower in September 2007 (see Table 2). If we exclude SDL’s technology revenue from its total, it joins a cluster of high-growth rivals in the range of US$100-200 million: SDL, Language Line, STAR, TransPerfect, euroscript, and SDI. In previous lists, we've noted how little of the overall language revenue is earned by the Top 20 (now 25) language service providers. That hasn’t changed, although they cranked the percentage up a few points over last year (see Figure 2). Beyond that reality, we decided long ago to conflate all language service categories �C translation, localization, interpretation, internationalization, supporting technologies, engineering, and even language learning �C into a single measurable category. Otherwise, we would have been writing about a variety of very small, even more highly Balkanized segments. Finally, to determine whether the fragmentation is getting worse or consolidation increasing too much, we apply the Herfindahl-Hirschman Index (HHI) to gauge industry concentration and competition in the marketplace. The HHI calculates a weighted average market share (which is represented by the sum of the squares of the market shares of each individual firm). The scores range from 0 to 10,000. Low numbers indicate a very large amount of very small firms, while a large number correlates to a single, monopolistic producer. The HHI for the Top 25 companies is 66.34. This means that even if the 10 biggest companies in the industry merged to form a US$2 billion company, it is unlikely that it would be challenged by anti-trust authorities in the United States. Acquisitions fueled the growth of companies like euroscript and SDL. However, most companies report significant organic growth from the increased demand for their language services. Moravia had warned us last year that when the Microsoft long-march-to-Vista software program ended, it would have a drop in revenues, but that its non-Microsoft business was growing above industry averages. Revenue per employee is a measure of how efficiently a particular company is using its employees. In general, rising revenue per employee is a positive sign that suggests the company is finding ways to squeeze more sales out of each of its workers. When we cross-tabbed the number of employees and revenue per employee at the Top 25, we saw that the companies with the most employees �C L-3, Lionbridge, and hiSoft �C are also the least efficient. These three firms trail in productivity per employee, holding the twenty-second, nineteenth, and twenty-fifth places, respectively (see Table 4). Across the Top 25, we noticed an increase in efficiency as measured by revenue per employee. In our 2007 ranking, the average revenue per employee for the Top 20 companies was US$102,648.88. In 2007, that number reached US$162,914.48, for an improvement of 58.71 percent. What’s ahead for providers of language services? Common Sense Advisory sees an increasing need as companies increase their global exposure and, along with governments, strive to meet the needs of diverse populations at home and abroad. The ailing dollar pushes exports from the U.S. Some of the biggest American brands �C across all industries �C have used the retrenchment of the dollar to shield themselves from slumping profit margins. Declines against world currencies make U.S. products look cheaper overseas, and translate into big returns when sales are converted back into dollars. Multiculturalism attracts public funds and marketing dollars. Societies across the globe are becoming more heterogenous. With the internet and satellite TV, a person can live and work in a country, use its services and infrastructure, and never need to speak the local language. This is the case of Brazilians in Japan, Turks in Germany, Poles in the British Isles, Arabs in Sweden, and Spanish-speakers in the U.S. This trend drives the need for language services in the public sector and big opportunities for multicultural retailing efforts (see “Reaching America’s e-Latinos: Otra Vez” May07). Decoupling of the U.S. economy shifts translation budgets. The world's developing nations are no longer nearly as dependent as they used to be on the United States and other developed nations to keep themselves going. Consumer spending is rising almost three times as fast in developing nations as it is in rich nations. Real capital spending is rising by double digits there, while it's rising only a bit over one percent a year in rich nations. Meanwhile, emerging economies' trade with each other is rising faster than their trade with richer nations. Trade without the inter-language of English intensifies the demand for translations. Exchange rate fluctuations enable language services arbitrage. Savvy buyers are taking advantage of the price differential between markets to reduce their costs. European LSPs are selling services in euros and buying translations in the United States to improve their margins. An unintended consequence is that the location of a translator is no longer a key differentiator. A Swedish translator with knowledge in superconductive ceramics living in Peru is more valuable but cheaper than a generic translator living in Sweden.